The grounds at the Intercontinental Sanctuary Cove Resort match the beauty of any golf course I have ever seen! Photo Credit: Intercontinental Sanctuary Cove Resort. One night was all it took to fall in love with the Intercontinental Sanctuary Cove Resort. I came to known Intercontinental Hotels on last year’s “Journey to Olympic Golf.” They were my safe haven and luxury at its best as I travelled down through Central America and stayed in capital cities like San Salvador, Tegucigalpa and San Jose. Staying at an Intercontinental Hotel implies a high standard of service and privacy, which was delivered by a courteous and attentive staff. In Australia, on the Gold Coast, not far from Brisbane, the Intercontinental Sanctuary Cove Resort, as the name implies, was my harbor of delight once again. Springtime in Australia brings out the beautiful flowering orange pōhutukawa trees. 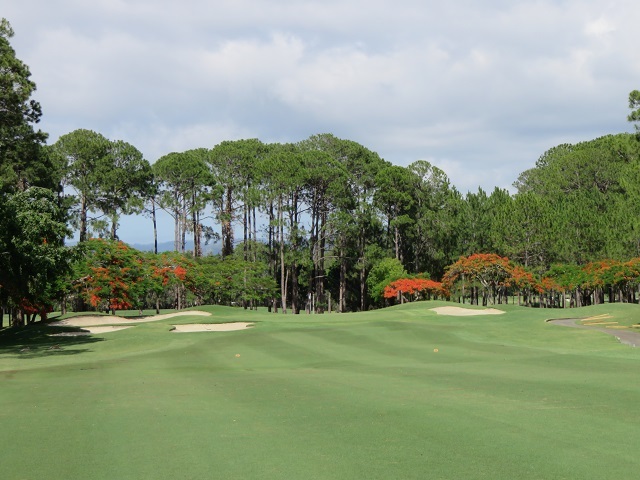 Resort to me means there is a golf course and in this case there are two—the private Pines, the only Arnold Palmer-Signature Golf Course in Australia and the recently renovated Ross Watson-designed Palms. As fate would have it I expected to play the Palms and was excited to see the renovation work but there was an outing on the Palms and I was “forced” to play the private Palmer Pines. So I meandered through a pine forest instead of trying to navigate my ball on undulating fairways surrounded by bunkers and palm tree. 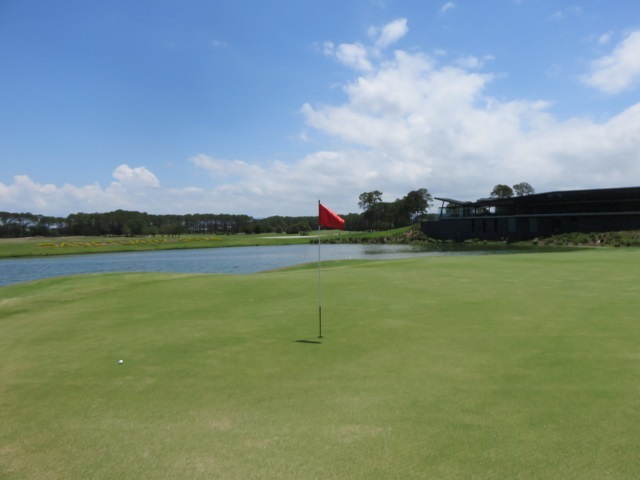 While Surfer’s Paradise is a few minute drive away, this is Golfer’s Paradise and no driving, except your golf ball, is needed once you are on site! The Intercontinental Sanctuary Cove Resort is the Gold Standard for golf resorts on the Gold Coast and throughout Australia! 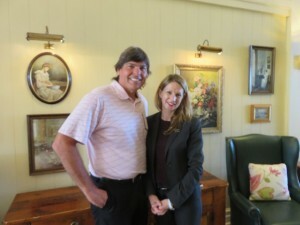 With Monique Harmer, the charming General Manager of the Intercontinental Sanctuary Cove Resort. This is likely the most unique property in all of Australia with “the grand and graceful architecture of a Queensland estate” Like the design of a stately manor, you arrive at the high point of the property entering in the Great House and passing through, if you like, down gently sloping manicured terrain to the lagoon pool below. The views from the windows everywhere on property have sensation sight lines that mix the water, the greenery and the blue sky in majestic and creative ways. This is a resort you will remember for a lifetime! CLICK here for the video interview with Monique Harmer, GM of the Intercontinental Sanctuary Cove Resort. My interview with General Manager Monique Harmer tells more of the elegance, service and comfort that you will find at the Intercontinental Sanctuary Cove Resort. 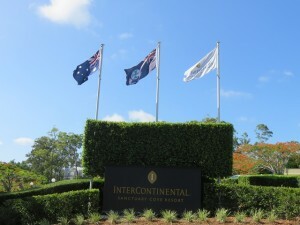 While the resort was built as the first master planned community in Australia twenty-five years ago, the affiliation with Intercontinental is relatively recent beginning in 2012. 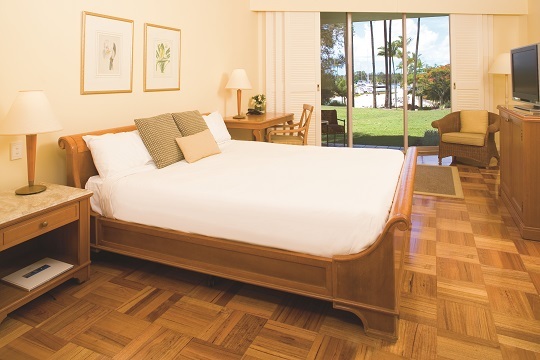 You will find a spacious room, comfortable bed and a balcony with a view. Photo Credit: Intercontinental Sanctuary Cove Resort. 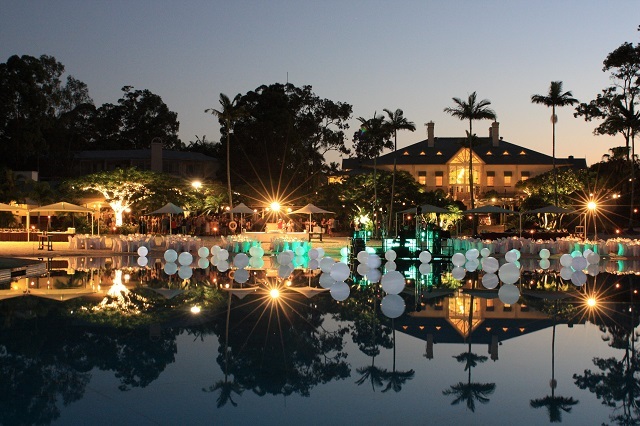 As the first Intercontinental resort in Australia and the first branded Intercontinental in Queensland, this is a high profile property. Intercontinental is the first truly worldwide luxury brand hotel with 170-plus Intercontinental locations. There are about twenty Intercontinental Hotels in the United States mainly situated in major cities such as New York, Chicago and Los Angeles. Check one out in the homeland and I am sure you will be as captivated as I was and then seek them out abroad when away from home. I visited during the holiday season and it was a festive atmosphere. Year round the Intercontinental Sanctuary Cove Resort offers an ideal place for the whole spectrum of relationships within the life of any family. From an early romantic relationship getaways to engagement and wedding celebrations to family vacations to a place to enjoy with adult children and your grandchildren. The Kids Club, aptly called Planet Trekkers, has a full range of activities and creative personalized attention for each child. Monique said there are families coming back each year since it opened looking for and enjoying their “understated luxury” and making special memories of everybody’s lifetime, young and old. Outside is a good place to be day or night! Photo Credit: Intercontinental Sanctuary Cove Resort. The Intercontinental Sanctuary Cove Resort is also a place to conduct corporate business. Intercontinental meetings for up to 500 participants occur within 14 dedicated meeting rooms or outside on ten acres of manicured lawns. There are 243 guest rooms, including 24 suites, and each one has a balcony. My room overlooked the marina while others have golf course, lagoon pool and garden views. To recreate when not meeting, as mentioned there are two golf courses and five tennis courts and a 25-meter lap pool along with a gymnasium. On the culinary side there are four options ranging from the signature Fireplace restaurant featuring authentic fine dining Australian cuisine to casual dining in the Cove Café. The Verandah Restaurant Bar offers spectacular views of the resort grounds. Create your own collage of Intercontinental dining, recreating, relaxing and relating experiences. Enough of the resort accommodations and staying experiences, as no matter how grand they are, it is still about the golfing experience with me! 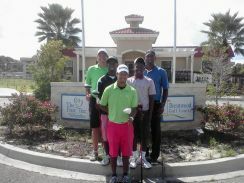 The Palms Clubhouse at Sanctuary Golf & Country Club. While Frank Sinatra may have been the main act for Opening Night of Sanctuary Cove, but it is Arnold Palmer that is the staying act with the challenging, championship Pines Course. 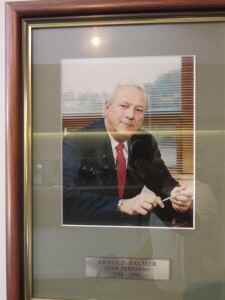 Arnold Palmer won the 1966 Australian Open at Royal Queensland Golf Club in Brisbane not far from the Intercontinental Sanctuary Cove Resort. He came back to build a legacy course, the only Arnold Palmer signature designed golf course in Australia, and like the club so much he served as its president for the first two years. What a great course the Pines is! A classic design with the first nine routing generally clockwise and the second nine counterclockwise. There is water, pine trees and kangaroos galore to watch your round but don’t expect any applause for a shot well played. I particularly liked the short 325-meter par-4 seventh hole, a dog-leg left, lay up tee shot with a short iron across water to a well bunkered green. The 425-meter par-4 finishing hole is a great test of golf to conclude any match or medal play. With water on the left from tee to green, the hole bends to the left and the green is guarded by water front and two sand bunkers. With “Sanctuary Cove” in shrubbery on a knoll across the water and sleek modern clubhouse set on a hill, this is the ultimate member spectator viewing area to see the conclusion of club events. CLICK here for video interview with Dave Saunders, Golf Manager at Sanctuary Cove Golf & CC. 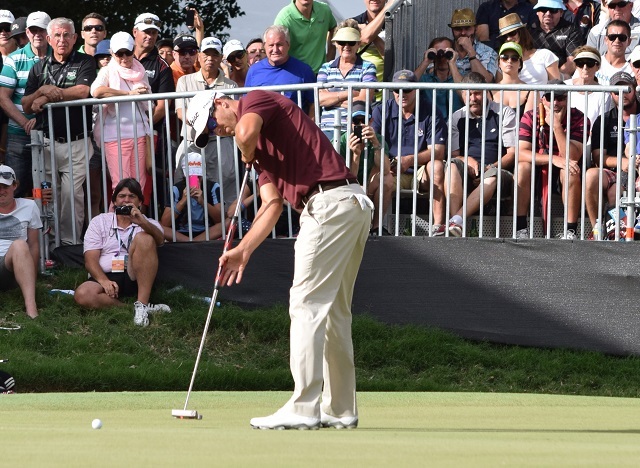 Adam Scott putting in the 7-hole playoff loss to Greg Chalmers at the 2014 Australian PGA Championship. Note the guy with the camera in the background. Photo Credit: Bruce Young. 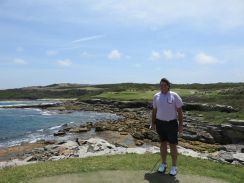 Mr. Palmer may have designed a fabulous golf course on what is known as Hope Island but a local golfer kept the hope of an Aussie winning The Masters alive and brought home the trophy in 2013. 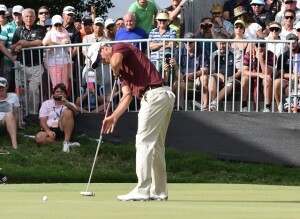 Adam Scott was born in Adelaide but his family moved to up to Queensland when he was only 7-years old. 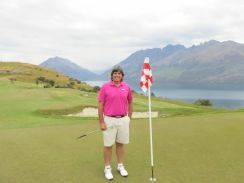 His father Phil is a member of the Australian PGA and his mother Pam is a keen competitive golfer. They, like Adam, live at Sanctuary Cove and Pam has her name on a plaque in the clubhouse for winning The Pines Cup in 2007. The 18th, a great finishing hole at the Sanctuary Cove Golf & CC Pines Course. 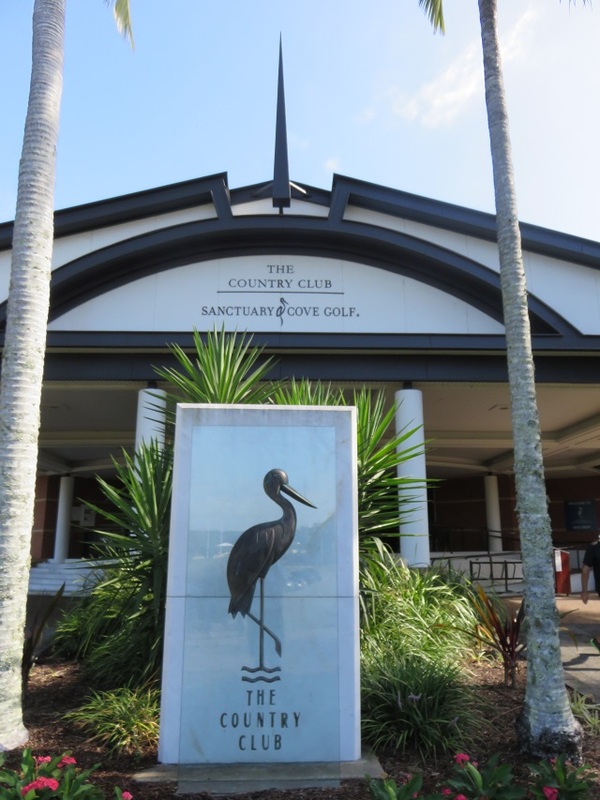 When you talk about golf in Australia, one doesn’t have to look too far to see that the Sanctuary Cove Golf and Country Club is the heart of the sport. As Adam found out at an early age the Gold Coast is also quite the paradise for surfers. While I was joking in the interview with Monique I really wasn’t joking in my mind. If I could come back as one to the 370 kangaroos on site at the Intercontinental Sanctuary Cove Resort I would! 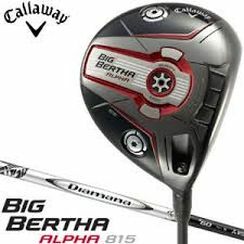 I would be the Joey Golfer Kangaroo with the big smile on his face and a driver in my forepaw ready to hop into your foursome if needed. I hope to see you there! 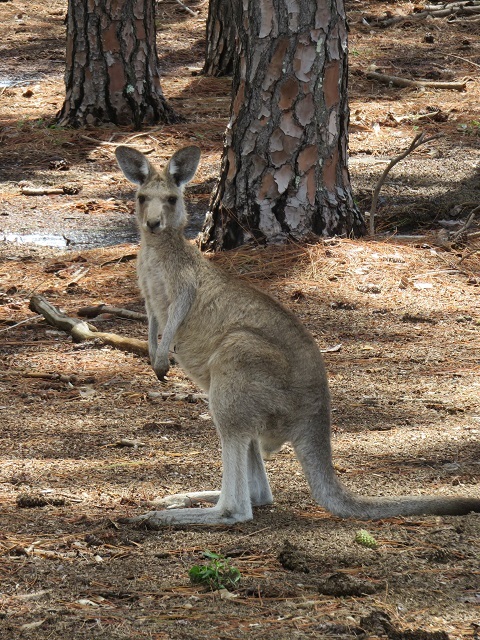 There are kangaroos amongst the pine trees and one day I hope to be one of them! 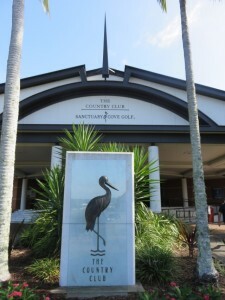 Mr. Palmer was the original Club President at Sanctuary Cove Golf & CC. 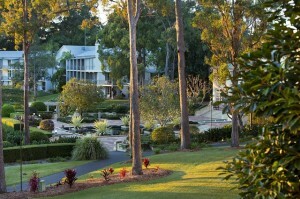 Intercontinental Sanctuary Cove Resort, one of Australia’s premier golf resorts!